BBC coverage: Live women's road race on BBC One, BBC Two & Red Button on 27 September; live men's road race on Red Button and BBC Two on 28 September. Live text commentary of men's and women's road races on BBC Sport website. 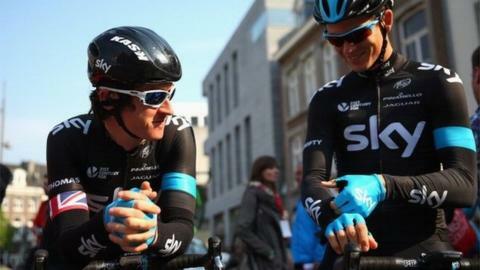 Britain's Geraint Thomas will be riding in Sunday's road race at the World Championships in Ponferrada, northern Spain. In his latest column for the BBC Sport website, the Welshman, who won on the road at the Commonwealth Games in Glasgow, explains his role in the nine-man squad, British hopes after a disappointing race in 2013, and why he does not expect to reach the finish line. With no British riders finishing the race, last year in Italy was not good at all. But it's not about proving a point this year, it's about getting out there and having a good race. Nobody was on top form last year, this year we are ready for it. Having said that, I'm not 100%. I had a little crash while training in Nice a few weeks ago - I was on my time trial bike and hit a little stone on the road, my hands came off the bars, I hit the deck and took off a lot of skin. I hurt my hands too. That spill disrupted my training before I went to Quebec for two one-day races on 12 and 14 September. And then I headed to Spain for last Sunday's team time trial, the opening race of the World Championships. We race in our professional teams for that one race, whereas the rest of the week, we are in national colours. Team Sky finished fourth but I was dropped. It was just one of those days where I didn't have the legs. We started off at a quick pace with six riders but once you start going into the red in an event like a team time trial it's really difficult to recover, especially when four riders were going so well. It's a full-on race, not like a road race where you can hide in the peloton to regain some strength. I went back to Cardiff for a couple of days after the team time trial and returned on Thursday for the road race. The course for the 254.8km (158.33 miles) race, which is made up of 14 laps of 18.2km, suits me and if it was back in June, I'd be going for it. There are only two climbs on each lap and neither are that tough, although it will add up to more than 4,000m of climbing during the race, which should take a little over seven hours. The race comes at the end of a long summer for me though, with the Tour de France, Commonwealth Games and Eneco Tour and then my crash in Nice hasn't helped. So I am purely there to do a job for Ben Swift. I'll be staying with Swifty, to help him as his domestique. If he needs anything - like a bottle, food, raincoat, or new wheel after a puncture - I'll be helping him out. Given the early weather forecast is for stormy conditions, my role will also be to keep him sheltered from the wind as much as I can. There is a high percentage chance that I will not finish the race. For me, it will all be about the first 150-200km. It's all part of trying to get a British winner of the race. At this stage of the season it's about the head and motivation because there are a lot of tired legs and minds in the peloton. I find it best to try and break down the race into sections of kilometres, as I would on any normal road race, rather than laps. It could crack you mentally to just keep counting the lap markers as they go down one by one. Once my race is over, it will be over to Luke Rowe to help out and by the time he's done, the race should be into the final 30km or so and then it will be for Chris Froome and Pete Kennaugh to be active. The Worlds has been a big focus for Swift and he has the best chance within the team with the way the course is. He has got to hang in there to reach the finish because it is a long race but we are not putting all our eggs in one basket. Pete and Froomey can follow moves, while we have the young Yates twins, Adam and Simon, who are both good climbers and having a phenomenal first season. It's a strong team. Australia's Simon Gerrans is my favourite for the race victory. He is one of the fastest riders in the peloton and is in great form, having won both races in Canada earlier this month and was third in a recent race in Hamburg which is known as being a sprinter's race - Mark Cavendish was fifth - so he has speed. He also has form in the tough, hilly one-day races, having won Liege-Bastogne-Liege back in the spring. Ireland's Dan Martin could also go well. He won Liege in 2013 and is similarly good in the one-day races. Germany's John Degenkolb is another rider who I would have picked to go well. He has the ability to get over these climbs and stay in contention but he has been in hospital after a crash at the Vuelta, where he won four stages and the points jersey. He has been passed fit to race but his form will have suffered. Peter Sagan is another who I'd expect to be in the mix. The course is almost tailor-made for the Slovakian but he was not going well at the Vuelta and pulled out to try and recover for the Worlds, so his form is an unknown. Portugal's defending champion Rui Costa is in decent form though, having finished second in Montreal last week and he'll be keen to go well, while home favourite Alejandro Valverde, who was second in 2012 and 2013, and has two silvers and one other bronze to his name, may like the course. The pure climbers are going to have to ride hard early to try and distance the sprinters though because the two ascents on each of the 14 laps are not hard enough for them to ride away. I wouldn't be surprised to see a 20-30-man sprint at the finish. However, there is more than 3km of downhill to the finish off the top of the final climb so an attack on the ascent, if committed, may make it to the finish. And that is where Gerrans may just try to make his move. Geraint Thomas was talking to BBC Sport's Peter Scrivener.